At the beginning of the game, players have access to 24 playable characters. 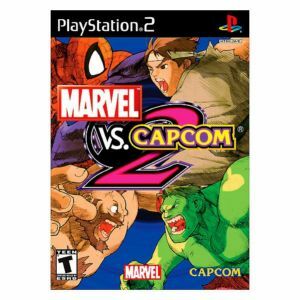 From the Marvel universe players can choose from Cable, Marrow, Cyclops, Captain America, Dr. Doom, Rogue, Psylocke, Wolverine (bone claw version), Iceman, Spider-Man, Hulk or Venom. The line-up of Capcom characters includes Jill, Tron, Rubyheart, Son Son, Amingo, Hayato, Sakura, Guile, Ryu, Zangief, Anakaris and Strider. As players meet certain conditions they will gain access to many hidden and secret characters. 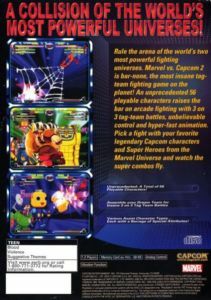 Marvel vs. Capcom 2 includes all the features from the arcade version. Now as never before, players can choose a character to experience three-on-three fighting mayhem. Players can perform limitless Hyper Combos, Crossover Counters, Advancing Guard and Super Jumps, all popular features from the acclaimed "vs" series. Real 3-on-3 tag team battle! Team Hyper Combo – Allows three characters to perform Super Combos successively.